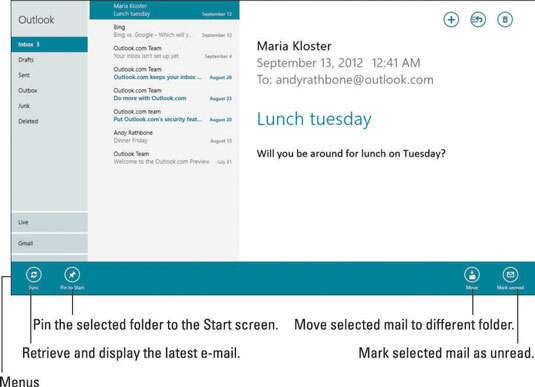 A tap on the Mail app’s Start screen tile brings the Mail app to your Windows 8 tablet’s screen. Even if the app’s already running in the background, a tap on its tile brings it front and center. 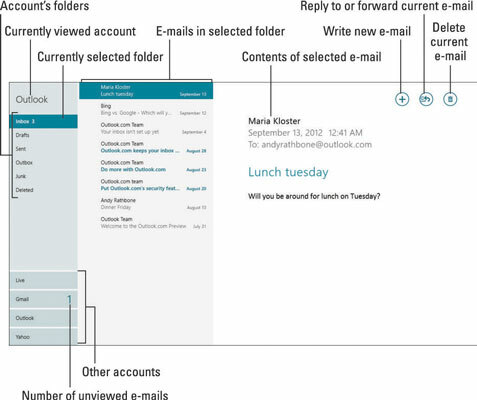 Left column: The name of your currently viewed e-mail account appears at the top; that account’s folders appear below its name. (The highlighted folder is the one you’re currently viewing.) At the bottom of the column, you see names of any other e-mail accounts you’ve set up. To see mail from another account’s mail, tap that account’s name. Can’t read an e-mail’s tiny letters? Then put two fingers on the tablet to stretch or pinch it until it’s the right size. Inbox: When you open the Mail app or switch between accounts, you always see the contents of your Inbox — the holding tank for newly received messages. Drafts: Started a heartfelt e-mail but can’t finish it through your tears? Store it in the Drafts folder to finish later: Tap the Close icon shown in the margin; when the drop-down menu appears, tap Save Draft. Later, when you want to finish the e-mail, tap this folder to see it waiting for completion. Sent Items: Previously sent e-mail lives in here, letting you reference it later. Some accounts, like Gmail, only show your last two weeks of sent messages. Deleted: Deleted something by mistake? Look in here to find it. To delete something permanently from the Deleted Items folder, select it and tap the Delete icon. Outbox: The Mail app immediately tries to connect to the Internet and send your message. If your Internet connection isn’t working correctly, your message lounges comfortably in this folder. Once you’re connected with the Internet, tap the Sync button, if necessary, to send the message on its way. Like all apps, the Mail app hides its menus, and, like all apps, you reveal those menus by sliding your finger upward from the bottom edge of the screen. The App bar appears, with all the app’s menus in tow. The App bar is context-sensitive, meaning it changes to show icons relevant to what you’re currently viewing.